Emergency workers trying not to bring down the rest of the pancaked, seven-story building pulled out Zhang, 35. A bulldozer had to raise its scoop 18 feet so workers could lay her in it. As they did, a rescuer raised a thumbs-up to the crowd of neighbors, who cheered and clapped. The image of the eight-month pregnant Zhang being carried on a stretcher — her stomach protruding from under a blue sweater and pink pants — was played on TV screens and newspapers across China as well as in media abroad. Her 63-year-old mother also was pulled out alive. Zhang named her 7-pound, 4-ounce girl “Ai,” or “Love,” in honor of the rescuers and other strangers who have showered her with kindness, gifts and VIP treatment since she was pulled out of the wreckage. Because Zhang spent 50 hours trapped in the partially collapsed building, doctors said her unborn child initially suffered some dehydration and low blood sugar. By the time of her birth Wednesday, however, she had improved and doctors said she was healthy. Because of the publicity stemming from her rescue, Zhang became something of a celebrity. She was flown first-class from Sichuan to Urumqi, located in her home region of Xinjiang in China’s far west, and was given a private room in the maternity hospital. Doctors and nurses, who clearly were moved by Zhang’s saga, donated clothing to her and her mother to replace items lost in the quake. The staff also gave gifts for the baby: clothes, a stroller, a tiny bathtub, bottles, shampoo, lotion and wipes. Her room also contained gifts of fruit and a bowl of hard-boiled eggs, dyed red for good luck. On Wednesday, Zhang was still a bit groggy from the Caesarean section, but she spoke briefly by telephone with her husband, Pan Yuncheng, who remains in a refugee camp in Dujiangyan. The phone call was set up by a local radio station. “I want to thank all the people that were helpful. It was very moving,” he said in the conversation as his daughter gave out a loud yell over the phone. 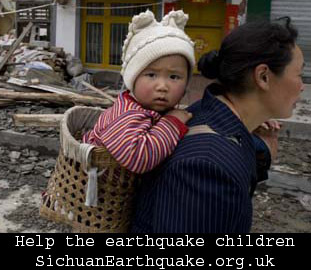 The family is now among the 5 million people left homeless by the earthquake, and Zhang said she plans to stay in Xinjiang with her mother until living conditions improve in Sichuan. This entry was posted on Thursday, June 19th, 2008 at 10:57 am	and is filed under Stories. You can follow any responses to this entry through the RSS 2.0 feed. You can leave a response, or trackback from your own site. Hello, i feel that i saw you visited my site so i got here to A§go back the chooseA¨.I’m trying to in finding issues to improve my site!I guess its adequate to make use of some of your ideas!! Comment pouvez-vous jugez comme cela? Les connaissances accru qu’il ne faut pas avoir..son des lois et des d? ?crets par centaine ainsi qu’une bonne formation d’architecte. Etes-vous agent immobilier ? Si oui vous faite honte ?? la profession, sinon venez donc faire la formation ad? ?quate et vous vous excuserez de vos propos. I simply wanted to thank you so much all over again. I do not know the things that I would have accomplished in the absence of the actual ways revealed by you regarding such subject. This was a very frightening concern for me, nevertheless being able to see the specialised approach you handled the issue took me to leap with happiness. Extremely happy for the information and as well , sincerely hope you comprehend what a great job you were doing instructing the others thru your site. I’m certain you have never met all of us. of birth, duration of birth, length and weight accurately. twelve months of his life but all upon the feelings. price tag on something, there is a panic attack. are those favorite dishes and desserts that induce a tingle in one’s mouth.